I-70C is an ion laser pared to its essential functionality. It is an entry-level device ideally suited for light industrial and scientific applications such as flow visualization, microscopy, and spectroscopy. I-70C features a compact laser head and an aluminum resonator for rapid warm-up and high stability in in single-wavelength operation. It incorporates the same metal-ceramic plasma tubes, linear passbank power supply/control unit, and digital remote control found on our more elaborate I-90C and I-300C models. I-70C is also offers a mixed gas (Ar+Kr) option for those looking to maximize their wavelength coverage in a single package. The INNOVA 70C has earned an excellent reputation as a laboratory and industrial workhorse. 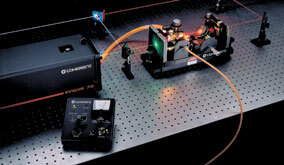 It provides a unique combination of high performance and affordability for applications such as Raman spectroscopy, fluorescence spectroscopy, laser pumping, and laser doppler velocimetry. The INNOVA 70C is available in argon, krypton and mixed-gas configurations, with output wavelengths from the ultraviolet to the infrared. ​1 All powers are listed in Watts. Guaranteed power specifications for standard systems are indicated in bold print. All power specifications, except multiline visible and IR, are TEM00. 4 Maximum peak variation over any 30 minute period after a 2-hour warm-up. 5 Measured with a 10 Hz to 2 MHz photodiode driving a resistive load at 514.5 nm for argon systems and 647.1 nm for krypton systems.